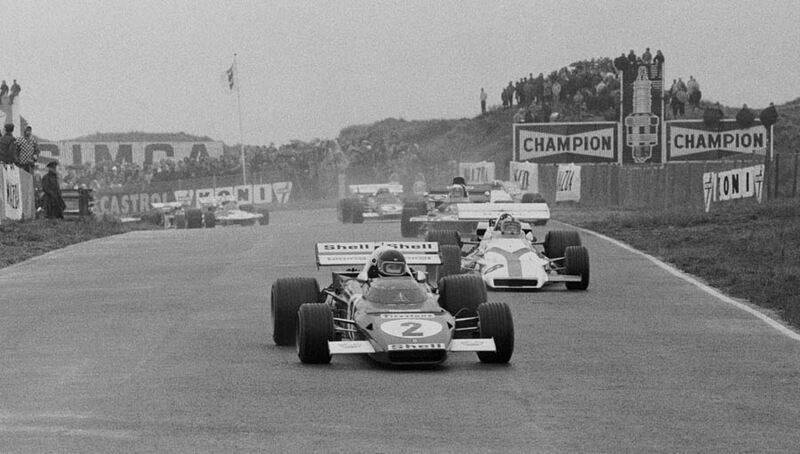 Jacky Ickx won the Dutch Grand Prix for Ferrari with an impressive display in appalling conditions - the rain hammered down and a high wind blew sand from the trackside dunes onto the circuit. "When one of the cars added oil to the mixture near the end of the race", noted The Times, "the surface had as much grip as snow and ice." The whole weekend was dominated by the issues of safety. The Belgian Grand Prix, which should have been held a fortnight earlier, had been cancelled because work to barriers at Spa had not been completed, and there were moans aplenty about conditions at Zandvoort. Jackie Stewart was the most vocal critic, understandably angry that no barriers had been erected at the spot where Piers Courage had been killed a year earlier. Two accidents in practice - fortunately both Mario Andretti and rookie David Walker escaped unhurt - hardly helped the mood of the increasingly militant Grand Prix Drivers' Association. Ickx and Pedro Rodriguez (in a BRM) occupied the front row of the grid and the two of them had a private battle at the front, swapping the lead several times. Behind them, more than a dozen cars spun and slid inside the first half hour, including championship leader Stewart, by reputation a master in the wet. He came home a distant 11th. Reine Wisell had an unfortunate end to his race when he overshot the pit entrance, reversed and was disqualified. Clay Regazzoni finished third despite losing the nose of his Ferrari after skidding four laps from the end, while Ronnie Peterson's reputation continued to grow as he added a fourth to his impressive second at Monaco, fighting off a relentless challenge from John Surtees. Local driver Gijs van Lennep, only allowed a place because organisers hoped his presence would add 5000 spectators to the gate, proved detractors wrong with a solid performance to come home eighth.